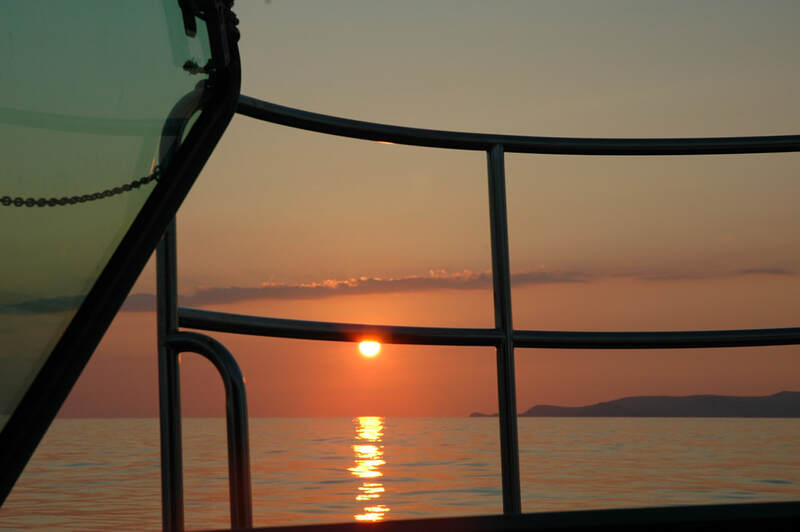 Our ﻿Sunset Cruise rates as one of the best things to do in Hersonissos and is sure to be a cruise that you will long remember after you have left Crete! Starting late in the afternoon from the port of Hersonissos, our cruise takes you to the picturesque Saint George's Bay where you can enjoy swimming and snorkelling in the crystal clear waters of this peaceful bay! Continuing, you can relax on board admiring the view of the shoreline of Hersonissos, Gourgouthia, Drapanos, Stalida and Malia and the unique Mediterranean blue while daylight prepares to give way to night magic. A spectacular sunset adds a whole new dimension to the experience. Watching the sun sinking in the archipelagos is undeniably one of the most beautiful moments one can experience with all these colours changing! Heading back to Hersonissos just picture yourself relaxing under a sky full of stars with the moon reflecting on the sea water while admiring the fully lighted shoreline feeling the cool sea breeze and the absolute serenity! Come, join and experience a different boating pleasure! 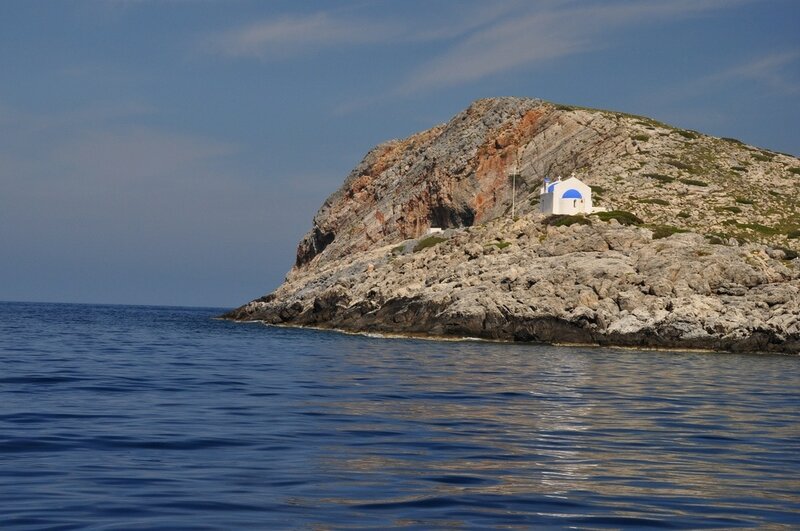 We start our trip from the port of Hersonissos and we set sail for the island of Dia, an island small in size but great in history, mythology, wild beauty and environmental importance. On the way following the route of Minoan sailors since Dia was the main harbour of Minoan Crete, you can sit back, relax and at the same time enjoy the magnificent view of the Cretan coastline while ''sipping'' the Mediterranean Blue and the sun. Feel the thrill of Jacques Yves Cousteau when on his quest for Lost Atlantis he discovered the Cyclopean (huge) walls underwater, proof of the archaeological importance and history of Dia. Let your mind travel through time and myth and imagine when Zeus (Dias) turned a dragon into stone to protect Crete, giving Dia its shape. On approaching Dia, the impressive, weird, powerful and unique beauty of its wild rocks enchants you. Once on island, you can cool yourself swimming and snorkelling in the crystal clear blue waters of Dia. While swimming, a delicious barbecue with best quality materials is being prepared for you. So after swimming back on the beach a freshly grilled BBQ, salad and soft drinks will be waiting for you. Sit back and enjoy your lunch with a glass of traditional home made Cretan wine. After lunch, you can relax a little bit more and wander around the island to get some photos before going back on board. On the way back, sit back and relax while experiencing a sailing cruise with sails up (weather permitting) wandering into the memories of the day and admiring the magnificent view. On arriving back at the port, you will know that your trip to Dia Island will be an unforgettable experience! A unique boating experience not to be missed! Dia (greek word for Zeus) was a dragon, as the legend goes, who wanted to attack and destroy Crete. But Zeus (Dias) wanted to protect Crete, as it was his birthplace, and threw some magic pieces of bread (the two small islets on the east) for the dragon to eat. The moment the dragon ate them he turned into stone and so Crete was saved! Apart from mythology, the island of Dia is of great historical and environmental importance. In antiquity, it was the shelter harbour of Knossos. That's what led Jacques Yves Cousteau to carry out an underwater exploration around Dia and find its remains in the waters between Heraklion and Dia. Also, on Dia there are a number of protected creatures including: the snail ''Albinaria retusa'', the lizard ''Pdarcis erchardi'', the wild rabbit ''Oryctolagus cuniculus cnossius'', and the eagle called ''mavropetritis'' (in greek). Dia is part of the European Network of Nature (Natura) 2000 and is a vetted hunting ground. There are also a number of protected plants such as ''Carlina diae''. ​Do you﻿ like fish﻿ing? What better way to enjoy it than on our Nemo Glass Bottom Boat? Grab the chance for fishing around the picturesque bays of Hersonissos, Saint George, Anissaras, Gourgouthia, Drapanos and Stalida and enjoy the view and the scenery of the Mediterranean blue, while waiting for the fish to grab your bait! 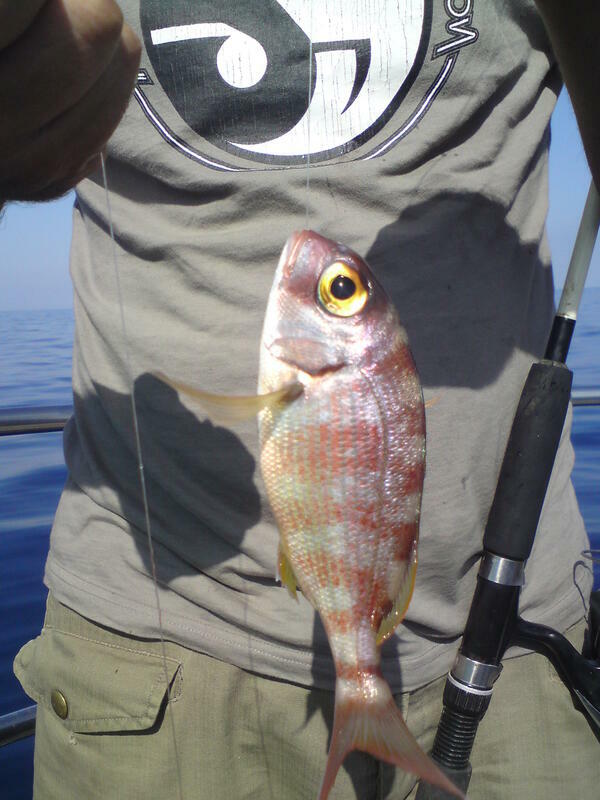 Fishing equipment and baits are provided. Swimming stops and barbecue are optional. Our tri﻿p starts﻿ from the port of Hersonissos on ﻿﻿N﻿em﻿o﻿ ﻿Glass Bottom Boat and takes you to the picturesque natural harbour and traditional fishing village of Sissi. Starting the trip, we sail over some reefs so you can have a look underwater and get to know the Cretan sea floor landscape. Moving onwards, we make a stop in the unspoiled Saint George's Bay, where you can enjoy swimming and snorkelling in the crystal clear waters with snorkelling equipment provided. 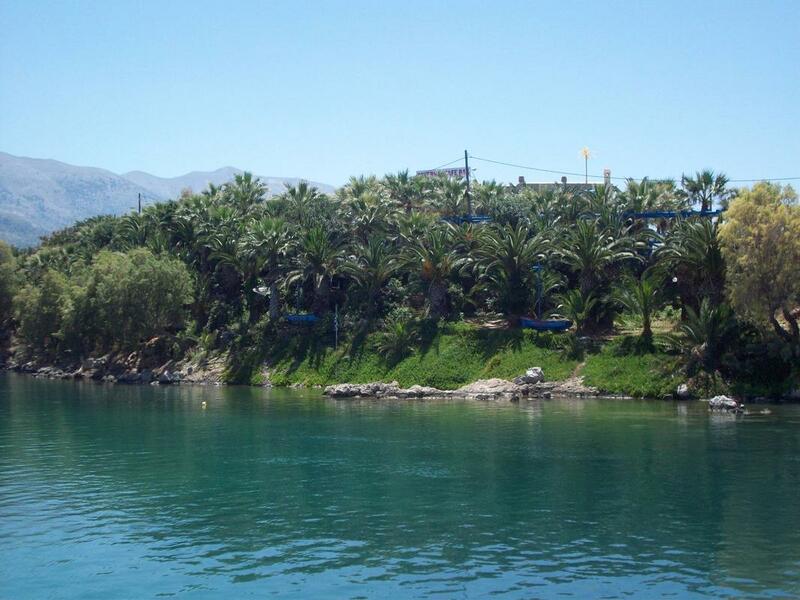 After swimming, we head towards Sissi at relaxing pace, giving you the c﻿hance t﻿o relax. During the trip, soft drinks will be offered to you to cool you while admiring the magnificent view of the shoreline of Hersonissos, Gourgouthia, Drapanos, Stalida, Malia and Saint Barbara and the sun sparkling on the Mediterranean blue! We arrive in Sissi, where we stay for about two hours and you can arrange your stay to your desire. You can walk around the village, go shopping, have lunch in one of the traditional taverns, have coffee/drinks in one of the cafes or go swimming and sunbathing in a nearby beach. On leaving Sissi, you get the thrill of a high-speed sail (up to 35 knots) having the sea breeze excite your senses! Sit back and enjoy the speed and the beautiful view of the coastline all the way back! A trip on Nemo Glass Bottom Boat to the picturesque harbour and traditional fishing village of Milatos. We start our trip from the port of Hersonissos. While cruising you can enjoy the view of the wonderful underwater world of the Cretan Sea along the beautiful shoreline of Hersonissos, Drapanos, Stalida, Malia, Saint Barbara and Sissi. During the trip, a welcome drink will be offered to you to cool you while admiring the magnificent view of the shore and the sun sparkling on the Mediterranean blue! On the way to Milatos, we make a stop in Boufos bay, where you can enjoy swimming and snorkelling in the crystal clear waters with snorkelling equipment provided. Then, on board again we continue our trip and we arrive in Milatos, where we stay for about two hours. You can walk around the village, have lunch in one of the traditional taverns or go swimming and sunbathing in the beach. On the way back just relax and get thrilled by the high-speed sail feeling the refreshing sea breeze revive you and enjoy the beautiful scenery around while going back to the harbour of Hersonissos. Routes may change due to weather conditions.